After a self defense shooting, you'll need to call 911. But this can put you in legal jeopardy if you say the wrong thing. Learn about the physical effects you'll experience after a shooting, why this can make you say things you might regret, and the correct way to make this phone call. If you watch TV and movies, you might think that it's a good idea to brandish your gun to back someone off, or shoot someone in the arm or leg, or maybe fire a warning shot. But many legal experts think these actions can get you into serious legal trouble. 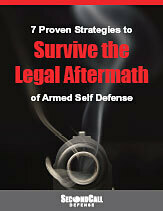 When it comes to armed self defense, it's usually not the shooting itself that trips you up legally. More often than not, it's what you do afterward that gets you in hot water. Here are 10 things you should NEVER do after you use a gun in self defense. CLICK HERE to join Second Call Defense. Use the Special Offer Code PODCAST to get your first month FREE!